I love the texture of burlap paired with lace. The combination of rustic and feminine fits my style to a tee. The best part... you can make your own in about five minutes. So a few weeks ago, my sisters, mom and I had a little get-together at my sisters house for a few days. We had lots of good food, the cousins got to play all day, and we did projects. The main project we worked on was building frames from old barn wood. We made them for a picture of my grandpa's barnyard that we all have. I will be sharing more about that project sometime. We also did a couple simple projects in the evening after the kids went to bed. 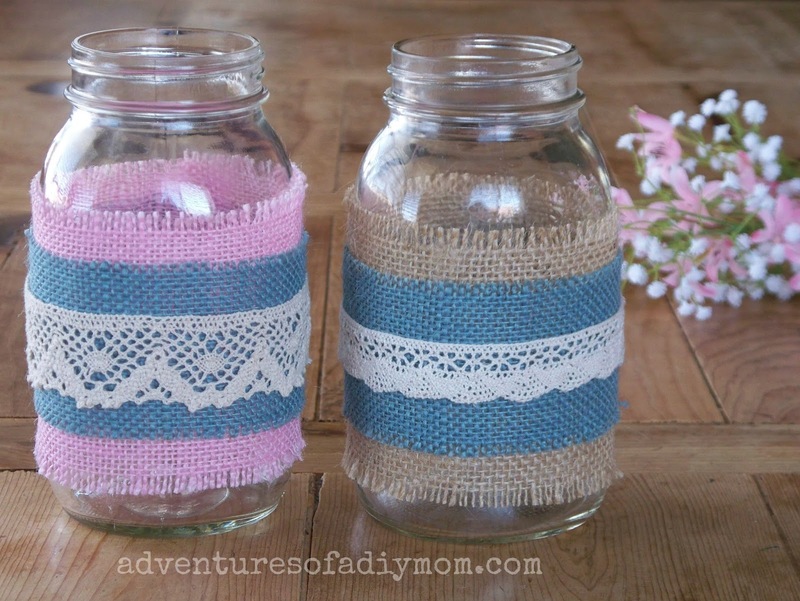 One of them was these burlap and lace mason jars. Have you seen all the colored burlap in the stores lately? I just can't help but get a 1/2 yard of each color when I see it. I've got a stash of cream, sage green, orange, dark brown, brown, blue and pink. I love the blue and brown together. And I thought the pink was perfect for spring and Easter. I ended up using the pink jar to hold our Easter Egg Tree, but it's super cute with the spring flowers that I grabbed out of my little girls room. 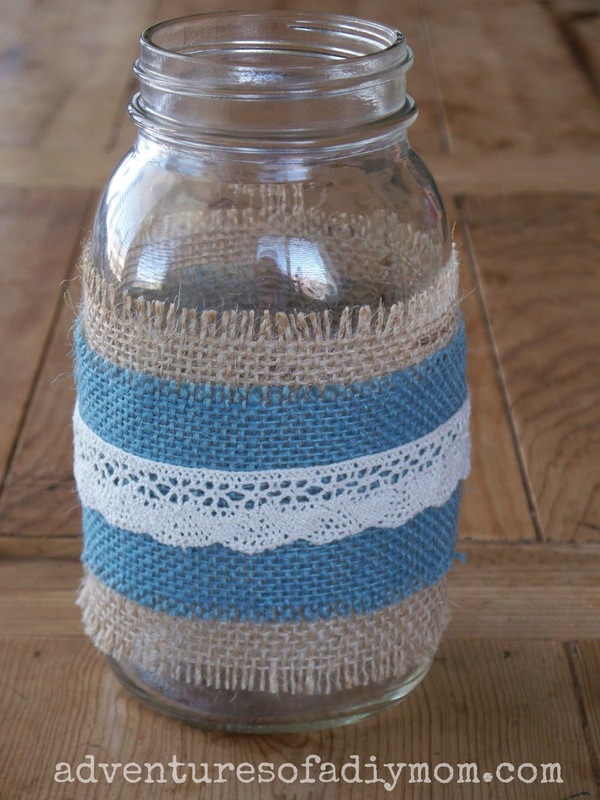 Want to make your own Burlap and Lace Mason Jars? I didn't do a step-by-step with pictures, because... well... it's just so easy. Cut a piece of burlap into a 4" strip. 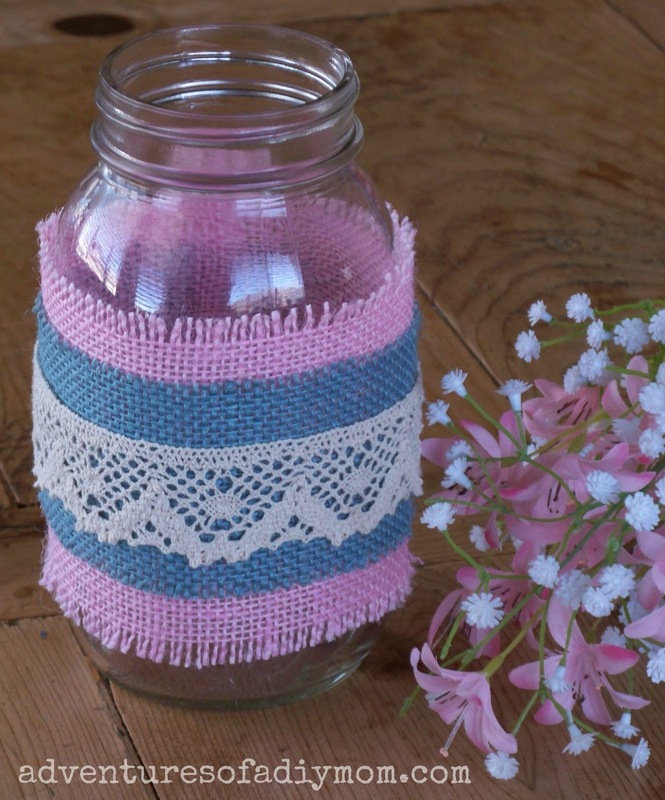 Wrap it around the mason jar and let it overlap about a half inch and cut. Then simply hot glue it in place. Repeat with a 2 1/2" strip. 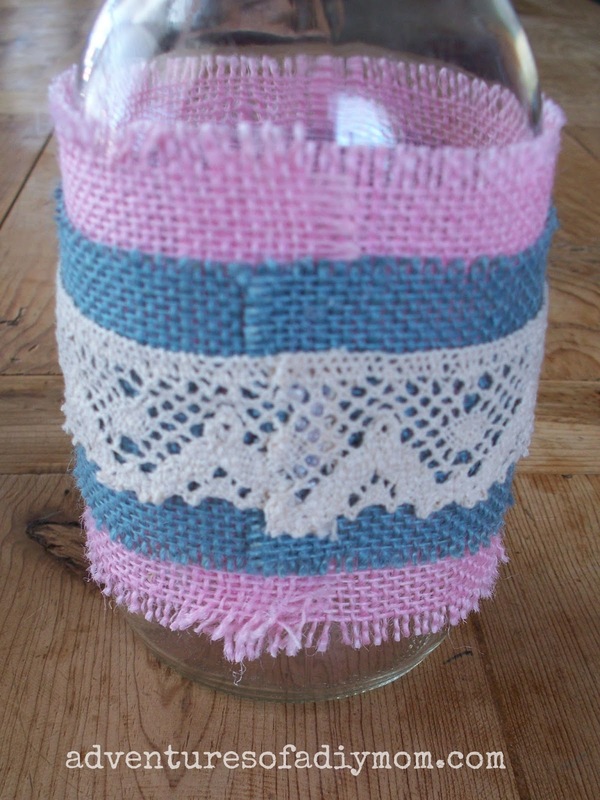 Then wrap your lace around the jar with a half inch overlap and cut. Then glue in place. A word about the lace - there were three colors of this crocheted type lace at my local craft store. There was white, cream, and then this color which has sort of a brownish tint to it. My preference for this project is the brownish one. 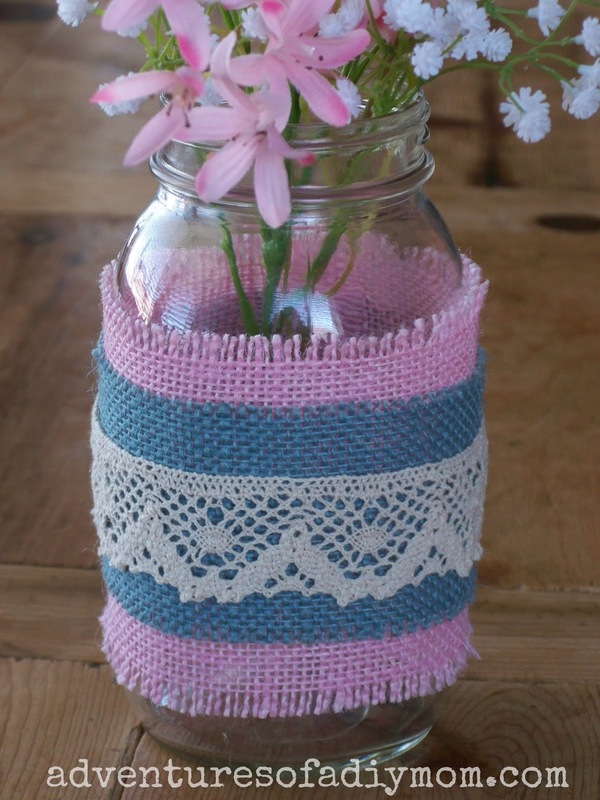 Are you a burlap and lace sort of person? You made the beautiful things. 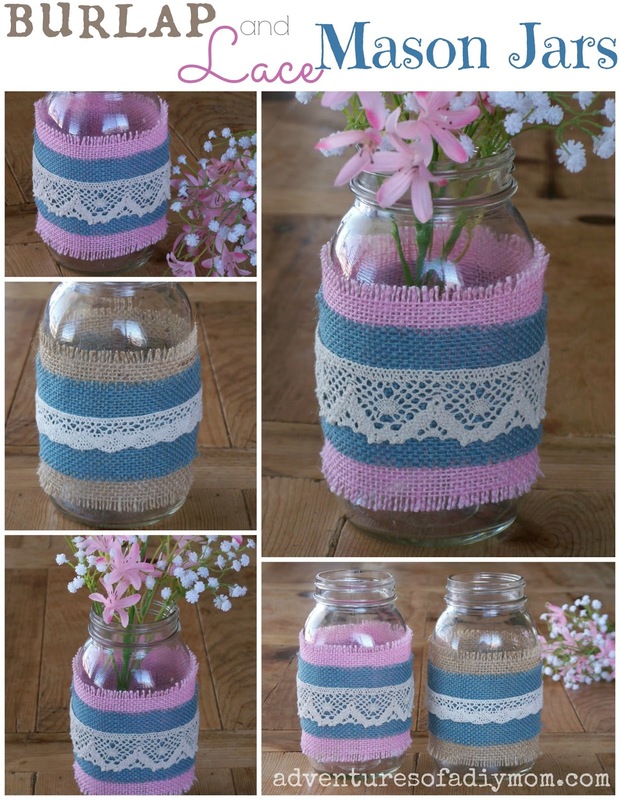 Pretty jars with "coating".